If you play mahjong with a group of friends or know people who do, you may want to entice them with some sugar cookies decorated to look like the game tiles. A neighbor and dear friend of mine asked me to make several of these cookies for her mother's surprise birthday party a short time ago, and I have to admit that they were perhaps the most challenging set of cookies I have ever made. I was a bit nervous about the whole project. Knowing nothing about the popular Chinese tile game, I scoured online for images of these game pieces, but it wasn't until I was given specific tiles to recreate that I realized I had my work cut out for me. 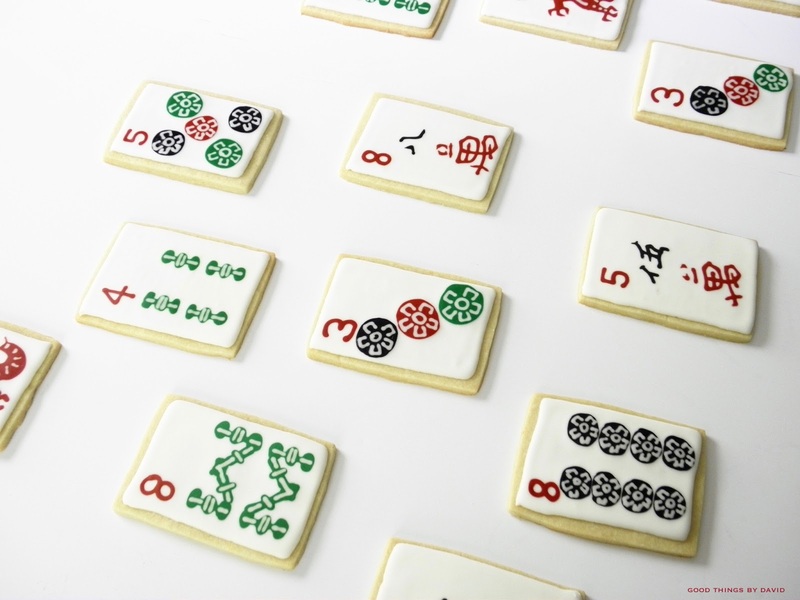 Rather than making diminutive cookies like the game pieces themselves, I decided to enlarge the images onto 4-inch rectangular cookies. I hope you're not too disappointed in the fact that I didn't take photographs of my creative process like I normally do. This project required a bit more concentration and quite frankly, I didn't want to mess them up! 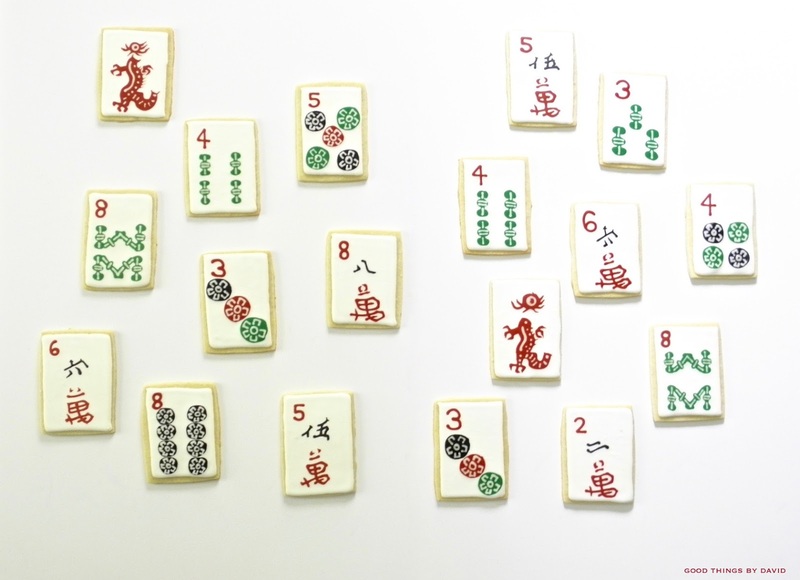 This is but a small sampling of some of the mahjong tile cookies. Using only four colors (black, green, red and white) I followed the examples of each tile given to me, down to the detailed strokes of Chinese calligraphy. Mahjong tiles are categorized by either of a rank or of a suit. I was told to create certain renditions from the bamboo suit, the circle suit and the character suit, as well as a few dragons. Note: in order to get the right shades of red and green, I added a little drop of black food coloring to each batch in order to darken the tone. I'm very pleased with the way these colors came out. Also, it is important to work with one cookie at a time. Everything you see here was piped using the wet-on-wet method. In other words, the bases were flooded in white royal icing, and the images, characters and numbers were piped with the corresponding colors while the base icing was still wet. 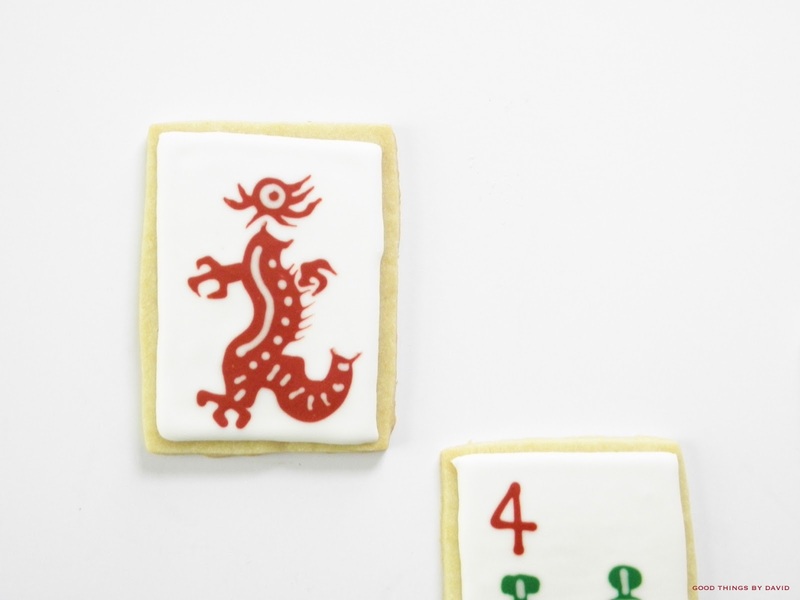 The Dragon mahjong tile was perhaps my favorite from the dozens of cookies I made. 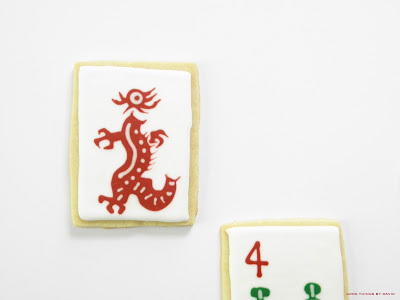 What I did was outline and flood the rectangular cookie in white royal icing, and then pipe a rough outline of the dragon with red royal icing while the base was still wet. With an icing decorating pick, I moved the icing around to create the claws and flames. I love the bamboo suit cookies. 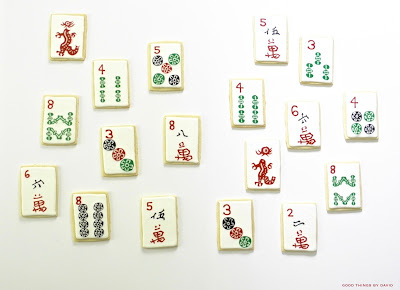 With a bit of patience and a very steady hand, piping mahjong tile cookies doesn't have to be a daunting task. As I said, it's best to work with one cookie at a time. You don't want to waste one moment piping the images, characters and numbers. You can, of course, use food-coloring writing pens to trace certain images, but in order to get the white shapes in the circle suits, you have to use royal icing. 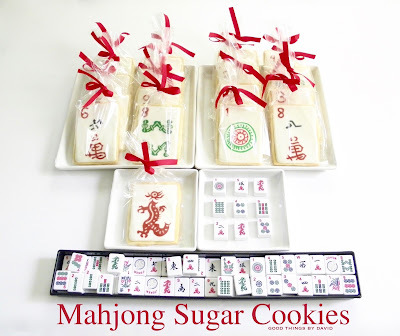 If you do decide to make some mahjong sugar cookies for your next gathering or for someone's birthday party, package them up in clear cellophane bags and tie them shut with bright ribbons like I did. Each one can be given out as a party favor. 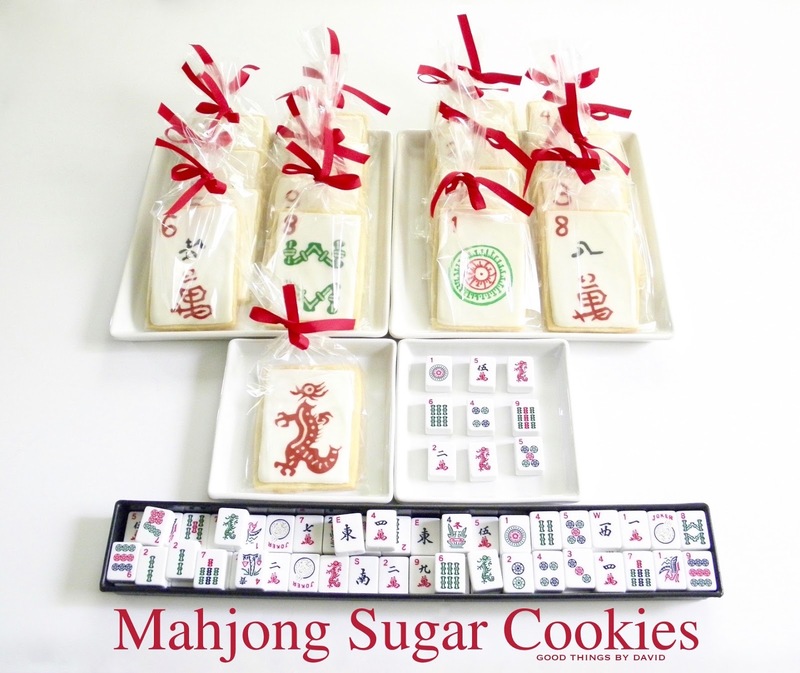 Candy Spelling would pay big money to have these cookies at her next Mahjong party! I think you should send her a link to this post and then... Sit by the phone! Oh my word, can you imagine?? ?